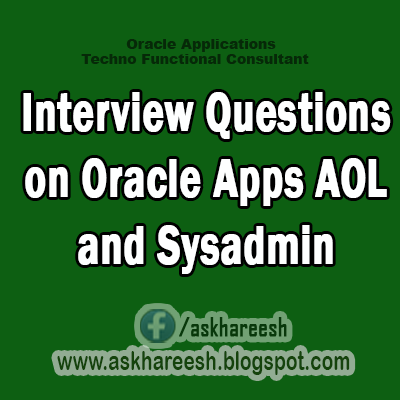 Find below the Interview questions related to oracle apps technical interview. The Questions are primarily on Sysadmin and AOL (Application Object Library) Responsibilities. The questions are in MCQ style. The answers are written at the end of each question. 1. Which of the following is not associated with a responsibility? 2. What do you need to do to allow a different user to see your output file? A. The user must log on as a system administrator. B. The user must have the View My Requests form in system administrator mode. C. The user must be logged on with the same responsibility as the user that generated the output file, and the profile option Concurrent: Report Access Level value must be set to Responsibility. D. The user must be logged on as the same responsibility as the one that generated the output file and profile option Concurrent: Report Access Level value is User. 3. When will a request group become a request security group? 4. How can you customize the SRS process? 5. Which is not a component of a request set? 6. Which of the following operations cannot be performed with the internal concurrent manager? 7. Which one of the following will be the correct outcome with two include rules in a combined rule? 8. When will the number of actual processes be less than the number of target processes? 9. Which of the following is not a component of parallel concurrent processing? 10. Which of the following is the overriding level for profile option values? 12. Which of the following is not a document sequence type? 13. Which of the following determines the subdirectory for an executable? 14. For what is the Token field used? 15. How are output files associated with various printer components?